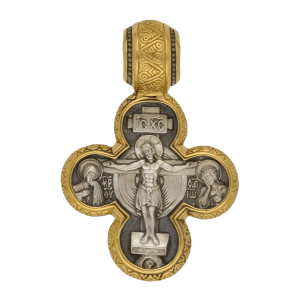 This cross pendant has been fashioned in the same style as most 17-th century Russian crosses and does not contain any iconographic imagery. It is four-pointed, with proportions close to the Greek ones, though the vertical bar is slightly elongated. The ends of the cross have been transformed into simplified lily flowers, tri-lobed shapes akin to a wedge. 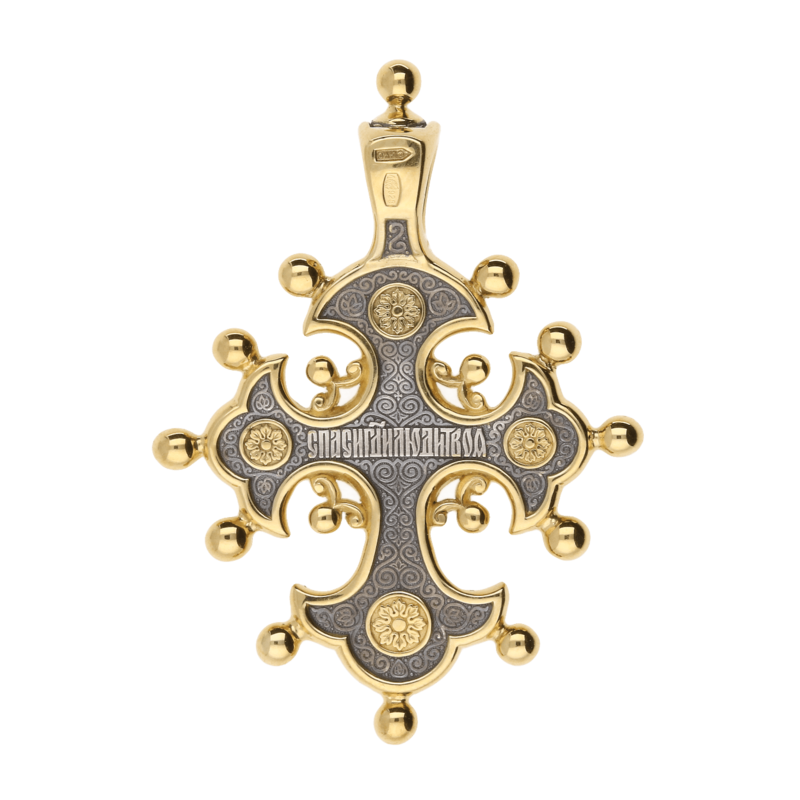 Traditionally, this blooming of the cross has been used to mark it as the Tree of Life. “The Tree of Life was planted by God in the garden of Eden,” says St. John of Damascus, “and was a precursor for the cross, for, as death had entered the world through a tree, so should be life and resurrection be given to us through a tree.” This symbolism is enhanced by the floral pattern that fills the empty spaces left on the front and back of the blossoming cross. 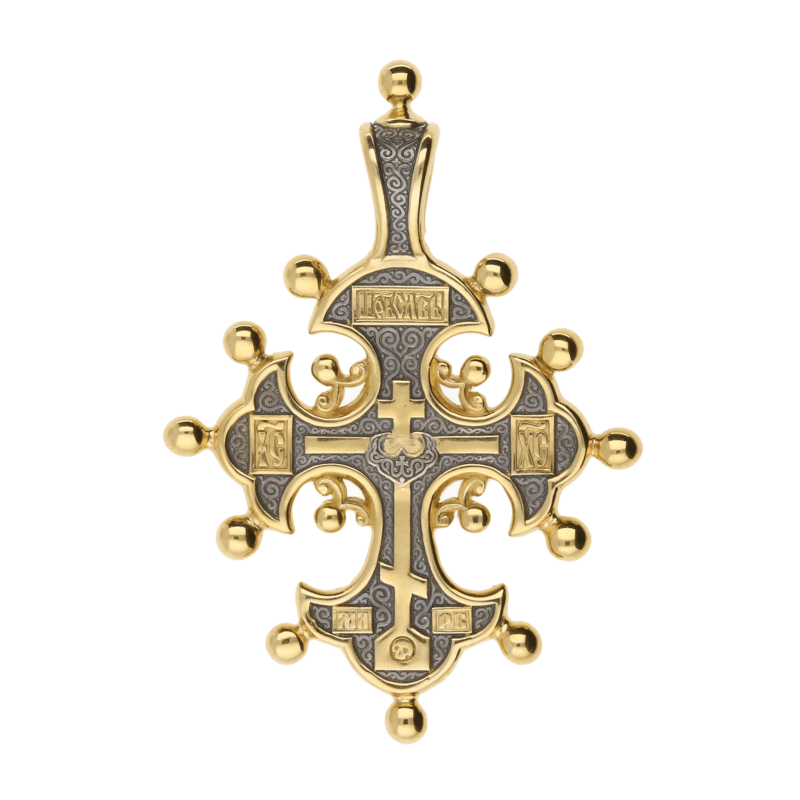 In the center of the cross there are four lily-like elements consisting of three lobes with a small bead at the top. 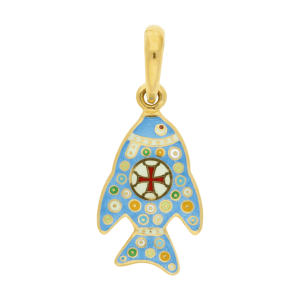 Together, they form a circle, which serves as a solar symbol. Thus, the plastic solution chosen for the center distinguishes it as a symbol of Christ, as stated in the phrase from the Gospel: “I am the light of the world…” (John 8:12). 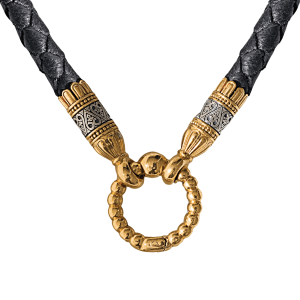 In turn, the four ball-shaped beads are understood as the four Gospels or the four Evangelists, carrying the light of the Gospel’s teaching to the four corners of the world. At the ends of the bars there are twelve ball-shaped beads, three on each, symbolizing the twelve apostles. 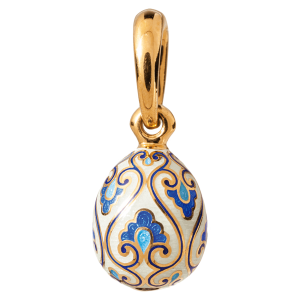 The front of the pendant depicts the Cross of Calvary with a crescent shape, called a “tsata” in Russian. 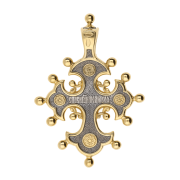 This shape stands for the rank of King and High Priest, and, when found in the center of the Cross of Calvary, traditionally refers to the Savior as the King of Glory and High Priest, Who committed a redemptive sacrifice for the sake of humanity. 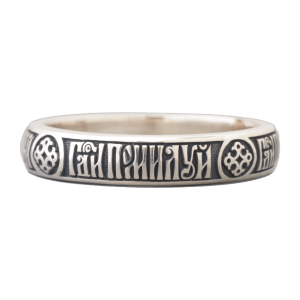 Like the crescent, the inscription at the top of the vertical bar, which says “Цр7ь Сл7вы” (“King of Glory”), glorifies Christ’s heroic deed. Along the edges of the horizontal bar there is a short inscription of Christ’s name, І&С Х&С (“Jesus Christ”). At the bottom of the vertical bar, next to the images of Mount Golgotha and Adam’s head, there is a cryptogram that reads “М.Л.Р.Б.”, deciphered as “место лобно рай бысть”, which can be translated from Church Slavonic as “the place of execution has become paradise” and refers to the fact that, with Christ’s sacrifice on the Cross, humankind regained the paradise it had once lost. On the back of the cross, along the horizontal bar, one can find the beginning of the troparion to the Holy Cross in Church Slavonic: “СПАСИ ГД&И ЛЮДИ ТВОZ” (“Lord, save Your people”). 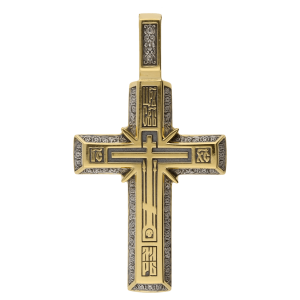 Be the first to review “Cross with wedge-shaped ends decorated by twelve beads” Click here to cancel reply. Šis kryželis keturgalis, jo vertikali sija šiek tiek pailginta, o sijų galai primena stilizuotus triskilčius lelijos žiedus. Kryželio centre yra dar keturi kitokio pavidalo stilizuoti lelijos žiedai, kurie kartu sudaro apskritimą. Priekyje yra Golgotos kryžius, po juo matyti Adomo galva, o ties jo centru – pusmėnulis. Priešingoje pusėje išgraviruota troparo Šv. Kryžiui pradžia. Kryželis papuoštas rutuliukais – po tris ant kiekvienos kryželio atšakos galo, dar keturi yra virš kiekvieno iš centre esančių lelijos žiedų. Išsamesnis produkto aprašymas galimas anglų ir rusų kalbomis.